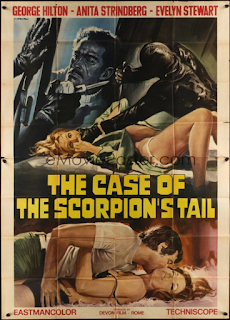 I'm returning to Sergio Martino for more tales of corruption, betrayal, and murder - The Case of the Scorpion's Tail. It's turning out that I'm really digging Martino's films overall. He's becoming a go-to director for me. With films like Torso, Your Vice Is a Locked Room and Only I Have the Key and Blade of the Ripper, he's rapidly becoming one of my fave giallo directors. Here, he brings us another police procedural style giallo and I thought it worked rather well. A woman finds out that her cheating and now deceased husband had a rather large insurance policy on her to the tune of a million dollars. But, his mistress knows this as well. And so begins the series of events that have us going round and round wondering "who dunnit?" in this epic little tale. I really don't want to say a whole lot more here. There are mystery elements that I don't want to spoil. We see some of our familiar gialli faces as well. George Hilton from "The Case of the Bloody Iris"and the awesome Anita Strindberg and Luigi Pistilli from "Your Vice Is a Locked Room and Only I Have the Key". Sadly, no Edwige Fenech. :::sigh::: It turns out Hilton is still working. I'd like to check out some of his more recent films. The Case of the Scorpion's Tail is super solid and well worth a viddy.